If you watched the GOP debate, you heard hours’ worth of talk about the terrorist threat America faces. 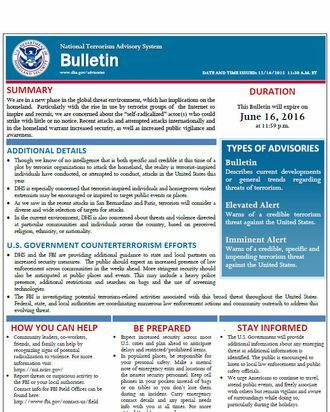 For those who prefer to find out about national-security dangers another way, the Department of Homeland Security has issued its first terror “bulletin.” It’s part of a revised National Terror Advisory System, meant to account for “intermediate” threats. Right now the bulletin is asking the public to be on the lookout for “self-radicalized actor(s) who could strike with little or no notice,” similar to the one in San Bernardino two weeks ago. The bulletin issued today is in effect for the next six months, unless something alters the threat level against the U.S. These notices also let the public know of any specific security changes the government plans to take, and also give the public some safety and preparation tips like the official version of “see something, say something.” The Guardian reports that the bulletins may be sent out for specific big events like concerts or sports matches.